399 pages | 72 B/W Illus. Why do enterprise systems have complicated search pages, when Google has a single search box that works better? Why struggle with an expense reimbursement system that is not as easy as home accounting software? Although this seems like comparing apples to oranges, as information and communication technologies increasingly reach into every industry the demand for easy-to-use work tools continues to grow. 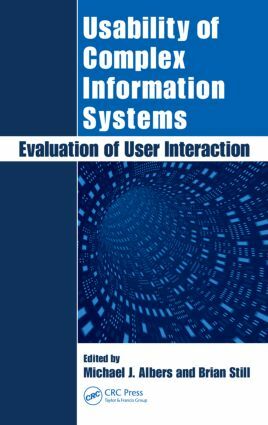 An exploration of cutting-edge approaches for evaluating the usability of complex user interaction, Usability of Complex Information Systems: Evaluation of User Interaction focuses on improving design and communicating content to the end user. Even systems that seem simple are, in fact, complex. The shopping interface for an e-commerce system may not be complex, but the databases, business processes, and logistics behind it certainly are. The examination of different aspects of designing and examining complexity presented in this book brings you a step further in developing a deeper understanding of what it takes to make complex systems work. "Taken as a whole, the papers in this book suggest a strong new direction for research in the user-centered design field. They highlight the importance of framing discussions of usability in an overall system, with all the complexity and potential framing that discussion entails."